Admitting he is a big fan of sweets and beer, Doug Swales after twelve years of having diabetes now knows how to manage the disease. This wasn't always the case as Doug developed peripheral neuropathy in various places in his body. Diabetes is the most common cause of peripheral neuropathy. High blood sugar levels in people with poorly controlled diabetes damage the walls of the tiny blood vessels that supply oxygen and nutrients to the nerves in the ends of the hands and feet and the essential organs in the body. As a result, skin becomes damaged and the loss of sensation only makes the skin of the feet more prone to damage. Doug cannot feel sensations in his hands and feet and has since lost his left foot along with a portion of his leg to amputation and a section of his right foot as well. Doug’s health began to rapidly decline during the fall of 2015. It was during this time that Bill, Doug and Sharon’s cat, passed away. It was heart breaking to Doug as the cat was like a child to him. It was wet outside when Doug buried her and as he was digging her grave in their backyard, his foot slipped off the shovel and unbeknownst to Doug, due to his neuropathy, he couldn’t feel that it broke his foot. It was two months later that he visited his doctor about the problem and was told that the bones inside his foot had become disintegrated so it was suggested that his foot be amputated. Without therapy and accessibility improvements to his home, Doug could not see how he could go home. 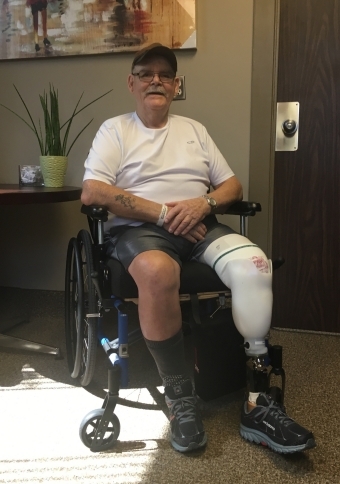 After spending almost three months in the Welland Hospital, Doug was interviewed by staff at Hotel Dieu Shaver Health and Rehabilitation Centre to discover his candidacy for therapy. After only two months of therapy at Hotel Dieu Shaver, there was already talk of a discharge date for Doug. “That first step was so incredible, I cried.” Doug has only positive things to say about the various types of therapies he’s received since being at Hotel Dieu Shaver. “I’m happy with everything, the people here.” NuStep is my favourite piece of equipment, along with the parallel bars, weights and the Niagara Wheelchair & Seating are out of this world!” Upon receiving advice from staff at the Hotel Dieu Shaver, Doug is “all set to move back in” to his house. He had his bathroom completely remodeled to make it accessible. Rails were installed beside the toilet to grab bars in the shower, Doug has a chair glider to assist him in getting up the stairs, two ramps for wheelchair access, two wheelchairs and canes. Doug and Sharon had planned and saved for a holiday to New Zealand this year but do to his health circumstances, he is no longer a candidate for travel health insurance. Doug has a warning for others in similar situations - “If you don’t look after yourself, it could happen to you too.” Instead of focusing on his loss, Doug has a new lease on life. For a video of Doug's interview, please visit the following link.